A lot of veterans have asked us the question, can you buy a condo with a VA loan? The short answer is yes you can. Many military members consider VA approved condos as an option rather than a traditional house. The purpose of a VA loan is to allow veterans a higher amount of freedom and comfort in their housing choices. There is a realm of possibilities in the housing world, and condos are practical possibilities to consider when deciding where to live. You can use a VA loan to purchase a VA approved condo, but VA eligibility and other parts of the VA loan process work in a slightly different way. Below is a video of Eric explaining more about VA approved condos and the basic process to purchase a VA approved condo. Why condos? A condo, or condominium, is defined by the type of ownership entailed and can take the form of either a single-family house or an individual apartment in a high-rise building. This type of ownership includes different requirements, but there are ample benefits that come with living in a condo. They are generally cheaper than comparatively sized homes, and tenants live a more social lifestyle. Like most homes, condos belong to a homeowner association. The HOA’s associated with condos are generally more restrictive than those with normal homes, but they do take care of those oft-dreaded maintenance chores, such as mowing lawns or fixing the leaky pipes. When considering purchasing a condo, there are many conditions that you must be aware of in order to make the most informed choice. As a veteran, one of these aspects is whether or not your VA loan eligibility applies to purchasing a condo. The building or complex is at least 50 percent occupied. At least 85 percent of owners are up to date with their HOA fees. Unaccepted – you cannot use a VA loan on condos in this status. If acceptance has not yet been determined, you can apply for approval. HUD Accepted – If HUD approves the project, the VA likely will too. Accepted without Conditions – A VA loan can and should be used on a condo that has been accepted without conditions. Chances are that if a condo is already approved by the Department of Housing and Urban Development (HUD), then it will be approved by the VA. To search for a list of VA approved condos you can search the Department of Veterans Affairs website, click here for more information. If the condo you are looking at is on this VA condo list, you know that you can move forward in purchasing it. The VA condo approved list is easy to access and maneuver. First, you request a customized condo report on the VA’s website. From there, you enter the name of the condo, the regional office where it is registered, and the location of the condo. Upon doing this, it will pull up all the condos that match your description. If your desired condo is on the list, simply notify your loan officer and the loan application process can move forward. First, talk to the property manager or the condo association and communicate your desire for VA approval. Although you may initiate this process, it is ultimately the association that has to go through the steps. If your manager or association cooperates with your request, they will need to supply the VA with the required documents. Once the request is submitted, the VA will process the documents through the RLC (Regional Loan Center) that has jurisdiction in the condo’s area. Depending on which office you are using, the length of the process will differ, but a general rule is 30 days. After the documents are reviewed, you will receive a notice of approval or denial from the VA and their reasoning. As was mentioned before, it’s very helpful if a condo is already approved by the HUD. If this is the case but the condo is not yet approved by the VA, the VA will automatically include the condo on the list of approved housing with proof of the approval from the HUD. This process is worth it if you’ve found the condo of your dreams. With proper communication with your lender and HOA, it’s simple to navigate VA approval on a loan. Note that regional VA offices deal with these requests and each has different requirements for documents, so it’s important to check with the regional office for what is required to get started. After handing over the initial documents, the VA will help you the rest of the way, asking for additional documentation if it’s needed and keeping you updated on what their decision is. Like I said above, this process can be quite lengthy, so it may be worth your time (as part of the condo association) to hire an attorney as this will accelerate the review process. Certificate of Eligibility (COE): this certificate proves that your military service qualifies you for a VA loan. This is the first document you need in the process and your lender is able to obtain it for you. Adequate Credit Score: the VA itself doesn’t have any rules about having a minimum credit score, but lenders are allowed to put limits on this. A higher credit score will afford you better interest rates while a lower score will mean higher rates and the possibility that you will not qualify for the loan. 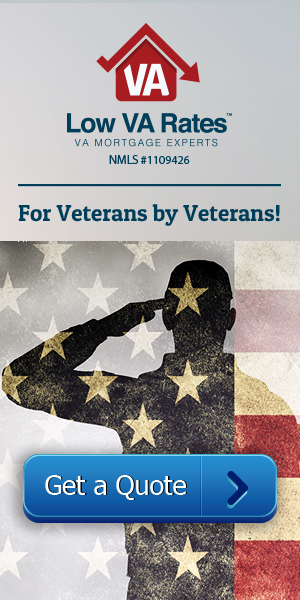 At Low VA Rates, we do not have any minimum credit score requirements. Debt-to-Income Ratio: this ratio measures how much debt a borrower has compared to their monthly income. The VA allows you to have up to 41 percent DTI, meaning no more than 41 percent of your income is going towards debts each month. Loan Limits: there are VA loan limits in place for each county in the U.S. The current typical loan limit is $424,100. If the home you are purchasing is beyond the limits for your area, you will need to use a VA jumbo loan and meet a few more requirements, such as paying a down payment and getting a second appraisal on the house. VA approved condominiums can be an excellent living choice for many military service members. Condominiums can offer spectacular views if you are in the right location. Many veterans and service members purchase VA approved condos in Florida, Hawaii, California and other scenic states. Another benefit of condos is they are relatively low maintenance. Yard maintenance and snow removal can be very appealing and most of the time condos offer amenities that you just are not going to get in your average home. For example many condominiums offer things like work out facilities, pools, and conference rooms. As an overview, remember that when you go through the process to get a condo VA approved, it will take anywhere from 30 to 45 days and could take up to 90 days. The cost to get one approved is $850, but VA approval never expires after its given. Also remember to gather whatever necessary HOA documents you can to expedite the process and you may even consider hiring an attorney to give an Attorney Opinion Letter. If you are considering a condo and have a loan question or want to know if the condo is approved for a VA loan call us now at 855-223-0705. Or click here to get started online.